Laughter, thrills, romance, chills - give all the fun of movie nights to your family & friends. No expiration date. Limit: 1 code per transaction, regardless of # of rentals. 1 time use of code only. Promo codes valid for a 1-day standard DVD rental or video game rental (see above for product type). Promo codes are not valid for prior rentals. Your payment card (necessary for any rental) will be charged the excess daily rental fee for a Blu-ray Disc or video game and the full daily rental rate for any additional items, plus applicable tax (except for MD rental transactions for which additional tax is not charged) for the first night of rental, if applicable, and will be charged the full daily rental fee for all items plus applicable tax (except for MD rental transactions) for each day you do not return your rental by 9:00 pm local time (at the box) after first rental night. Void where prohibited by law. Code must not be copied, sold, or otherwise offered. Any other use constitutes fraud. Cannot be combined with other offers. Not redeemable for cash. 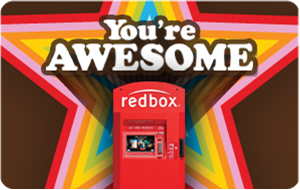 Offer subject to cancelation or change at any time.Redbox Gifts are issued by Redbox Incentives LLC. See Redbox Gifts Terms and Conditions for details.